CAMDEN, N.J. -- Camden veterans of the Civil War's U.S. 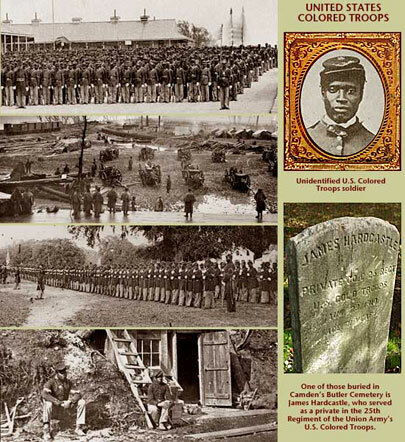 Colored Troop units are buried in Butler Cemetery, which was created for local African Americans who served with the Union Army. The Butler Cemetery tombstone shown above is that of James Hardcastle, a Camden resident who was a private in the 25th regiment of the U.S.C.T. In a watershed event in the history of the nation's racial relations, more than 200,000 free men of color and recently liberated slaves served in the Civil War in the Union Army's U.S.C.T. and naval units. African-American volunteers from New Jersey and Pennsylvania took their basic training at Camp William Penn outside of Philadelphia. A Camp William Penn graduating class is shown in the top photo above. A U.S.C.T. artillery unit in field deployment is shown in the second photo from the top. The third is a dress parade of U.S.C.T. troops assembled for the first official reading of the Emancipation Proclaimation that freed this country's slaves. The bottom photo is of U.S.C.T. troops outside a bomb-proof bunker at Dutch Gap, part of the Union seige lines around Richmond, Va., capital of the Confederacy. Keeping Abraham Lincoln's Blood on File in Camden, N.J.